See this page for known issues on later HIPE versions. Description: If any of the tasks is applied to a spectrum that contains a column of errors instead of weights, the task converts the errors to weights, propagates the weights and repopulates the error column by converting the propagated weights back to errors. This gives an error column that has not been propagated correctly for the operation applied. Workaround: Take into account that the output error column should be disregarded in the case of source data that lack a proper error column. Many FITS readers ignore this convention, so the special character & is read and included as the final character of the value. Others (IDL) do the same but, additionally, consider & an invalid character and it is replaced by an underscore _.
Workaround: None at this time. This problem did not affect previous HIPE versions. A warning will be written to the console in HIPE 13 if the old syntax is used. Task calls spanning multiple lines (with \ separation) are not detected. Some SPIRE scripts use multiple line task call scripts. The dialog box should show all lines which are going to be changed, but only the first line is shown there. Some non-standard task calls, like using two = signs to put the result into two variables at once, are not detected. Root cause: The cause is that the shared library path has references to the old Java 6 installation. Workaround: The current workaround is to remove the entries that contain JavaVM from this environment variable. To do that, modify or create the .bash_profile configuration file of the terminal and add the environment variable in an export statement without the corresponding entries. That should persist the changes. Versions affected: Potentially all versions older than HIPE 12. Root cause: The root cause is that the class herschel.spire.ia.dataset.PhotApertureEfficiency (among others) is new for data processed with HCSS 12 and doesn't exist in previous versions of HIPE. Previous versions cannot open tarballs containing these types of data. Workaround: The recommended workaround is updating HIPE to version 12.1. If you cannot upgrade HIPE, please contact the Helpdesk. HIPE 10 developer versions (builds between 2069 and 2674) and HIPE 11 (all builds) pools are incompatible with any other version of HIPE (including all public releases of HIPE 10). Case 1: Using pools created/modified in a HIPE 10 version prior to 2069 with a HIPE 10 version between 2069 and 2674. Case 2: Using pools created/modified in a HIPE 10 version between 2069 and 2674 with a HIPE 10 version between after 2674. Case 3: Using pools created/modified in a HIPE 10 version other than the 2069-2674 range with HIPE 11. Case 4: Using pools with an index rebuilt for a HIPE 10 version other than the 2069-2674 range with HIPE 11. A pool created with a HIPE 10 version prior to 2069. Pool you want to open: A pool like the one detailed in the prerequisite. Error message: There is no error displayed and the pool is completely usable in HIPE 10 versions 2069-2674. Pool you want to open: A pool that is like the prerequisite or has been processed in a scenario like CASE 1.
herschel.ia.task.TaskException: Error processing getObservation task: Index Version not compatible. Expected : 4 Existing: 6. Pool <pool_name> requires upgrading before you can use it with this software. In order to do so, you need to run pool_name.rebuildIndex() to upgrade. Depending on the size of the pool this process can take a long time, please be patient! More information can be found in the Data Analysis Guide, section 1.2.2.1 (Update of index format for local stores). pool_name is the name of the pool you are trying to load. pool_name.rebuildIndex() is not the proper command to rebuild the pool. See below for the appropriate commands. Pool you want to open: A pool that is like the prerequisite. Error message: There is no error displayed and the pool is completely usable in HIPE 11. Pool you want to open: A pool which index was rebuilt following CASE 2 instructions. That's it! You should now be able to use your pool in any of the above cases. If you find you cannot, contact the Helpdesk. Note that the index files will not be backed up while you run rebuildIndex(), unless you invoke Configuration.setProperty("hcss.ia.pal.pool.lstore.index.backup", "true") first. For more information execute the following command: help('dag:sec-lstore-index-compatibility'). See the HIPE Owner's Guide: Section 4. Where the "image" is the product that you have been working on. This will append the history dataset at the end of the product and "solve" the problem. There will be a fix in place for this issue in HIPE 11. None known in addition to those listed for HIPE 10.1. There is a previously existing issue that has become important in some cases when processing Solar System Object observations in HIPE that affects all Level 2.5 HIFI map products. Ephemeris positions are calculated (and stored in the ra_centre/dec_centre columns) with a spurious correction for stellar aberration. This is being fixed but, until patched, the recommended doOffset approach to translate Level 2 coordinates to a co-moving frame (see the corresponding known issue below on this issue in HIPE 10.0) will lead to coordinate offsets that are off by ~10" on average (depending on the relative velocity between target and Herschel at observation time). This is being fixed in HIPE 12 and it is expected that a patch will be made for HIPE 11 and, possibly, also patched in later releases of HIPE 10. The Plug-ins panel cannot be opened (from the Tools menu) if you're working under Linux and you don't have the Gnome 2 library installed. Gnome 2 is a desktop environment, and typically if you use a different desktop environment (Gnome 3, KDE, Unity, etc), then you will not have this library. A patch is planned for this issue in HIPE 10.2. The "Desktop API", which is used to access the browser when you click "Find more.." button in the HIPE plugin dialogue, is not supported on KDE. It "was designed to work on Windows and Gnome". However, you can also open it directly by pointing your browser directly to http://herschel.esac.esa.int/twiki/bin/view/Public/DpHipePlugins, and copying the URL to the respective .jar files for the particular plugin you are interested in and pasting it in the HIPE plugins dialog to install it. If you would like to have the "Find more.." button working, all you need is to have the Gnome libraries installed. See the Data Analysis Guide for a recovery procedure. You can download from this page the first and second script mentioned in the procedure. Change the extension from .py.txt to .py after downloading. The WCS explorer does not work on cubes for which ImageIndex is used to specify the wavescale axis. This is true for SPIRE and PACS cubes. If crpix3, crval3 and cdelt3 are used instead, the WCS explorer works. To be fixed in HIPE 11. Some SExtractor headers are not read successfully, due to an issue with the column position of units in the file header. Workaround: read the file with the tableType parameter set to SPACES. You can then fill any missing information by hand. Some Topcat files are not read successfully, due to an issue with quoted cells with spaces. Workaround: export the data from Topcat in FITS format, then read the FITS file back into HIPE. For information about reading FITS files into HIPE, see the Data Analysis Guide. The file format of variables exported with File --> Session --> Export has changed in HIPE 10. This means that HIPE 10 will not be able to read session variables exported with HIPE 9, and vice-versa. Open HIPE 9 and import the exported variables with File --> Session --> Import. Set Save variables on exit in the Preferences dialogue window, under General --> Startup & Shutdown. Open HIPE 10. The variables shall be restored in the Variables view. Export the variables with the new format of HIPE 10, with File --> Session --> Export. The reason is that HIPE tries to send data before the external application has initialised properly. This issue seems to occur more frequently with VOSpec. The solution is to send the data again without closing the external application. 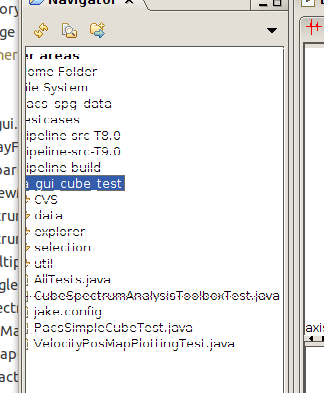 If you have two or more separate Spectrum Explorer GUIs open and at least one is undocked, when using its Cube Toolbox the separate SE instances talk to each other--spectra or new cubes you create in one instance will also appear in the other one. In HIPE 10 a new spectroscopy telescope background calibration was introduced. This update is not compatible with the code in HIPE 9. If you use HIPE 10, you should update to version 45 of the calibration tree to make use of several new calibration files. However, the target ephemeris inside HIPE doesn't get updated. I.e., doOffset uses the ephemeris current as of observation uplink to the spacecraft. Work is in progress to automatically update target ephemerids. If your target ephemeris was very uncertain at observation time (and if it has improved since), then you may be better off using a manual approach of downloading the Horizons ephemeris for each target. When a user tries to print a script to a file on disk, HIPE sends it to the printer instead. A patch will be issued for this problem in HIPE 11 and a definitive fix included in HIPE 12. If you use the background normalisation ipipe script for chopped spectroscopy in HIPE 9, you should not update the PACS calibration tree to version 45. You should keep using the calibration set 41 and cancel the update when the automatic calibration updater in HIPE asks to install set 45. By removing the file PCalBase_TimeDependency_FM_v45.fits from the directory ~/.hcss/data/pcal-community. There are remaining aesthetic issues regarding the pvMap aspect ratio modification in the task. There is a known error when extracting a pvMap with row < col (velocity dimension < spatial dimension). Workaround: set the correctAspectRatio parameter to False (in the graphical interface, untick the corresponding checkbox). None known in addition to those listed for HIPE 9.0. The performance of the imageConvolution task is severely degraded when NaN values are found in input data. HIPE 8.3 is not affected by this problem. Fixed in HIPE 9.1. Images larger than about 100 MB in FITS format can still take over a minute to load. During such time HIPE is unresponsive. Image analysis operations, such as cropping and adding contours, also take a long time on large images. The specFlatFieldLine task cannot handle NaNs in the fluxes of PacsCube products. This affected one observation as far as we tested. If you encounter this problem then you can mask the NaNs by running the function shown below. Copy and paste the function code in a new Jython script window in the Editor view of HIPE, then click the green double arrow icon in the HIPE toolbar to run the script. After that you can call the function from the Console view, passing the variable contaning your cube as argument: addInvalidMask(myCube). This button is enabled only when you change the state of one or more masks. Fixed in HIPE 9.1. HIFI cubes have in general a small number of rows and columns, while the spectral dimension is rather large (thousands of channels). The PV map is very narrow in the x direction and really wide in the y-direction, so that it does not fit in the Spectrum panel. When displaying the y-axis values, at its smaller zoom, only a small number of channels can be seen. Workaround: open the variable created from the variables pane and use the full Display/Image Viewer. Go to the .hcss directory in your open directory. Open the hipe.props file, or create it if it does not exist. In some cases the transpose task does not convert correctly the WCS of the input image. This problem occurs only when the WCS of the image defines the rotation angle (CROTA2). When the transformation matrix (PCx_y or CDx_y) is used, the problem does not occur. To be fixed in HIPE 10. The creation of velocity maps with the Legacy CSAT fails; the task will hang without an error message. CSAT is no longer supported and the new cube toolbox, which uses an improved algorithm for velocity map making, should be used instead. See 6.8.3 in the Herschel Data Analysis Guide for information about using the new cube toolbox. This is a display issue only, the flags set by flagTool are, in fact, used. None known in addition to those listed for HIPE 8.2. Task createRgbImage puts wrong WCS in the output. Instead of using the WCS provided by the Wcs input parameter, this task uses the WCS of one of the input images. This bug shall be corrected in the next Hipe versions. None known in addition to those listed for HIPE 8.0. Problem with transpose task. In some cases the transpose task does not convert correctly the WCS of the input image. This problem occurs only when the WCS of the image defines the rotation angle (CROTA2). When the transformation matrix (PCx_y or CDx_y) is used, the problem does not occur. Problem with NaN values with imageConvolution task. Starting from HIPE 7, the imageConvolution task works with images containing NaNs too. However, the results when NaNs are present (either in the map or around the coverage area) are not reliable. A fixed version of the task is scheduled for HIPE 9. Problem with correction of MADmap point-source artifacts. The PACS task photCorrMadmapArtifacts, used to correct point-source artifacts in MADmap produced Level 2.5 products, only works when the initial time-ordered data product (TOD) is created with scale factor of 1. All other values of scale factor may produce incorrect results. A fix, possibly distributed as a plug-in, will be available later. Problem with units in the Cube Spectrum Analysis Toolbox. This tool returns the wrong units of measurement with extraction plots and integrated maps. This issue has been detected with PACS data and is under investigation. Previous HIPE versions are not affected. User pool names (pool ID) restrictions: Old pools that do not follow the restrictions on the allowed names cannot be read in HIPE (eg a dot "." in the name is such a case). The user can safely rename the folder (found in the local store) following the rules: allowed characters in name: alphanumeric, dash ("-") and underscore ("_"), the name cannot start with a dash ("-") and cannot have "urn" as name. The pool ID is case-sensitive and must be with less than 255 characters. High memory usage with Mac OS 10.6 Snow Leopard. There are reports of HIPE 8.0.1 using all available memory and freezing while reprocessing observations under Mac OS 10.6 Snow Leopard. This problem does not seem to appear on other platforms, including other Mac OS versions. The problem is being investigated. Velocity Maps in the Cube Spectrum Analysis Toolbox. Fitting of faint lines (less than 2 sigma) or non-gaussian lines can result in incorrect velocities in the velocity map. It is advised to fit the velocity in a few positions manually in the spectrum explorer and verify the consistency with the calculated velocities at these positions in the velocity map in the cube explorer. Upgrade to Jython 2.5. Starting from version 8.0, HIPE will include a new version of Jython. You may have to adapt your scripts for them to work with the new version. See this page for the details. Links in the User's Reference Manual. Some hyperlinks in entries of the User's Reference Manual do not work, pointing instead to the top of the same page. Opening the HSA User Interface under Windows XP: If you open the HSA User Interface from HIPE while being logged in, the following error appears: JNLParseException[ Could not parse launch file. Error at line 0.]. The workaround is to log out in HIPE and start the HSA User Interface. If necessary, log in in the HSA User Interface and log back in in HIPE. Sending data from HIPE to DS9 under Mac OS: Using DS9 version 6.2, due to a problem with the DS9 application, HIPE fails to start DS9 automatically. Either use DS9 version 6.1 or start DS9 manually and re-send your image from HIPE. The DS9 team states that they plan on fixing this in the next release. Windows 7: The option to send an image is sometimes disabled in DS9. Windows XP: A SAMP message appears to be sent, but the image is not received by HIPE. All Windows versions: At DS9 shutdown, the following Cygwin warning appears, even when data transfer works correctly, like in Windows Vista. Solved known issue with step by step execution. The known issue found in HIPE 7.0 with step by step execution has been solved. You can revert to the old behaviour by choosing Edit --> Preferences, going to Editors & Viewers --> Jython Editor and unticking the Use improved step by step execution checkbox. HIPE drops Versant database connection under Windows XP: A problem can occur if HIPE is run under Windows XP connected via WiFi to a Versant database server. If the connection is interrupted briefly, the HIPE session may fail with a "Network layer read error". Linux does not have this problem because it keeps retrying for several minutes. Garbled text after horizontal scrolling in Ubuntu 11.10. A problem on systems with NVidia cards and running Ubuntu 11.10 can cause text to appear garbled when scrolling horizontally, as shown by the figure below. To solve the problem, add the following property to the user.props file, located in the .hcss directory within your home directory. If there is no user.props file, create it. None known in addition to those listed for HIPE 7.0. Cannot download data from the Herschel Archive due to corrupted cache. Choose Edit --> Preferences and go to Data Access --> Storages & Pools. Select a pool in the Pools pane and click the Clear cache button. Note that this button will not be available if there are no pools listed in the Pools pane. If the above does not work, clear the HSA cache manually by deleting the home/.hcss/pal_cache/hsa directory, where home is your home directory. If the above does not work, clear all caches manually by deleting the home/.hcss/pal_cache directory. If you have a high number of local pools on your disk (of the order of hundreds or more) you may experience noticeably high disk activity at HIPE startup. None known in addition to those listed for HIPE 6.0. Usually the velocity of a source with respect to the observer is positive if it results in an increase of the observed wavelength with respect to the rest value, and negative otherwise, according to the formula v = (lambda - lambda_rest) / lambda_rest. In the current implementation of the radialVelocity metadata into the ObservationContext product, this convention is inverted: the sign of the spacecraft velocity is positive when it is moving towards the target. The mosaic task fails if your default language uses a different delimiter for decimal numbers than English (for example, a comma rather than a dot). The file should be in the .hcss subdirectory of your home directory. If the file does not exist, create it. If the file already contains a line defining the java.vm.options property, you can add the two values -Duser.language=en and -Duser.region=en at the end of the line, separated by a space from the other values. The cursor readout from a velocity map created in the Cube Spectrum Analysis Toolbox indicates km/s, but the values are in m/s. Also, velocity maps created from a spectral cube with an upper sideband (USB) frequency scale have the wrong sign. Query with no results wrongly returns an empty product. When using the Product Browser perspective, a query with no results creates an empty product called p in the Variables view. In the Product Browser view, select a query source and search for an obsid that you know not to exist. In the Variables view, variables QUERY_RESULT and p appear. The QUERY_RESULT variable is correctly empty, as you can verify by issuing the command print QUERY_RESULT in the Console view. The p variable should not have been returned. You can safely delete it. See the Data Analysis Guide for more information on the Product Browser perspective. Slow startup due to error messages. See the HIPE Owner's Guide for information on how to set properties. None known in addition to those listed for previous 5.x versions. Issues in previous 5.x versions may still apply to this version. An error like the following can sometimes appear in the command line window from which you are starting HIPE. This error is harmless and can be ignored. May also affect older HIPE versions. Fixed in HIPE 6.0. Caches of PAL pools (most often used for accessing the HSA) can be corrupted when switching back and forth between HIPE v5.1 and previous versions. The result of this corruption is that the cache can silently give you other data than the data you were asking for. If you are switching back and forth between 5.1 and previous versions, clear your caches in the Data Access Preferences panel: From the Edit menu, select Preferences. Under Data Access, locate the Pools and Storages section. In the bottom right section of the panel, select the pool that has a cache enabled and click "Clear cache". Fixed in HIPE 6.0 and 5.3. HIPE does not start if there are too many local pools. This happens when the list of local pool names, separated by commas, exceeds 8096 characters. Zooming on an image may cause HIPE to hang. The zoom level at which this happens depends on the original size of the image. The saveObservation task with default settings fails to save an Observation Context to a pool. Workaround: delete the hsa_cache local pool directory and the $HOME/.hcss/pal_cache/hsa directory. Alternatively, move the hsa_cache local pool to $HOME/.hcss/pal_cache/hsa/pool/hsa_cache/. Note that you have to move the hsa_cache directory from your local pool directory into the above directory, so that you will have paths that have hsa_cache twice, for example: $HOME/.hcss/pal_cache/hsa/pool/hsa_cache/hsa_cache/herschel.ia.obs.ObservationContext. The ra and dec values in the metadata of an Observation Context (and hence the RA and DEC entries in the summary) can be significantly different from the target coordinates (raNominal and decNominal) entered in HSpot. This is caused from averaging the target and chop positions. Coordinates in the actual data are correct. The NearestNeighbourProjectionTask task, which creates a spectral cube from three-dimensional data, fails to create a target grid out of a set of target grids. A command such as targetGrid = nearestNeighbourProjection.targetGrid([tg1,tg2,tg3]) fails with an IllegalArgumentException. For more information on NearestNeighbourProjectionTask, see the HCSS User's Reference Manual in the HIPE Help System. In the LocalStoreWriter task, the default location of new local pools is $HOME/.hcss instead of the default $HOME/.hcss/lstore. This results in new pools being created in non-standard directories. Information about the locations of these pools is written in the $HOME/.hcss/hipe.props file. To remove a local pool in a non-standard location, delete the pool directory and the corresponding configuration line in hipe.props. To create local pools in the standard location, change the value in the Location field of the LocalStoreWriter task to $HOME/.hcss/lstore, where $HOME is your home directory (for example /home/mrbean/.hcss/lstore on Linux systems). A bug in Firefox may prevent the Help System from starting correctly (a browser window opens but nothing appears). This can be solved by deleting all the browser cookies, or just the cookies coming from 127.0.0.1 (the local system). See also General Help System issues on this page. Most entries in the User's Reference Manual have wrong or missing categories. The documentation shipped with HIPE still mentions JIDE in several places. JIDE was the data reduction application that came before HIPE and is no longer supported. With the exception of Appendix B of the Scripting and Data Mining guide, all references to JIDE can be applied to HIPE. The message INTERRUPTED while loading image can sometimes appear in the command line window from which you launched HIPE. This message is harmless and can be ignored. Ra/Dec coordinates in data cube meta-data are incorrect. In CLASS files generated via the HiClass task, the source velocity is not included or applied (i.e. the frequency scale is wrong). When the frequency calibration of WBS is computed from the values of the HRS spectra, the coefficient of the polynomial to be used are function of the temperature. These are not available in the calibration tree. The following scripts in the Pipeline --> PACS menu in HIPE are known to crash: extended_pipeline.py, L1_smallSource.py, L2_scanMap.py. Other scripts may crash or not be applicable because they depend on the results of other non-working scripts. Many scripts are not adequately commented. The data/pcal/PCalSpectrometer_ArrayInstrument_FM_v5.fits calibration file, dealing with spectrometer spatial calibration, contains incorrect values. This results in offsets of the order of one arcsecond between reported coordinates and commanded positions. Some tasks may be holding data products in memory unnecessarily, thus slowing down HIPE and possibly causing out of memory errors. In the photProjectPointSource task, the calibration = false mode (no longer recommended) is not flux conserving. The signalJumpDetector task is not registered at HIPE startup. The AbstractMapperTask may treat incorrectly a Wcs provided as input. When the input Wcs is defined using the CDELTi keywords, the result is correct, but when the pixels are defined with the CDi_j keywords, these are translated into CDELTi and CROTA2 keywords. This is not equivalent, if not rectangular pixels are required. The AbstractMapperTask has a bug in the generation of tod files which can result in an ArrayIndexOutOfBoundsException at the map generation. The spireCal task outputs an empty calibration context if the input pool does not exist, instead of reporting the problem. This results in errors when user scripts attempt to access the calibration files.